Normal cupric carbonate is not commonly available and the abbreviated term ‘Copper Carbonate’ is widely used to describe either of the two basic copper carbonates, the green malachite (CuCO3.Cu(OH)2), the blue azurite (2CuCO3.CU(OH)2), or a mixture of the two. 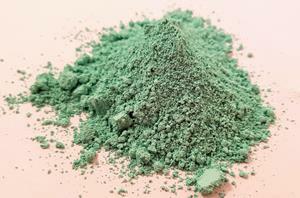 This product is the green malachite variety and is supplied as a fine powder. 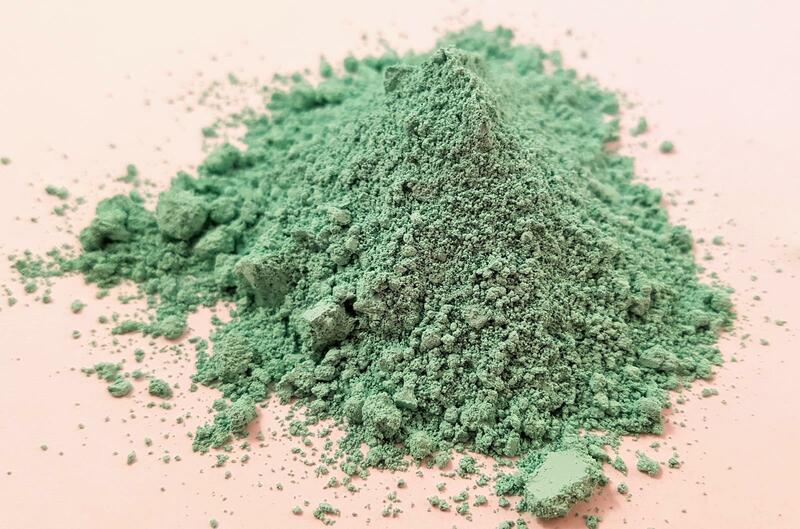 Pigment for paints and ceramics - Copper carbonate is used in pigments under the names mountain green, mineral green or verdeazzuro (green azure). While it is not routinely used in modern bulk paints, it is still desired for restoration and artists’ paints. Ceramics and pottery applications call for copper carbonate in slips (2-8%) and glazes (<5%, if more than 5% is added, glazes often change to a metallic pewter). The pigment will normally give a green colour when fired, but alkaline glazes will create a turquoise, and reds are achievable with a reduction kiln. It is not suitable for soluble glazes that will come into contact with food or drink as the copper can leach out. Boiling point: Decomposes at 290°C to copper(II)oxide and carbon dioxide. Solvent: Acetic acid, insoluble in water. Impurities: Maximums (Cl – 700ppm, SO4 700ppm, Acid Insolubles - 0.1%, MEA Insolubles - 0.04%, Moisture – 1.5%, Na – 2500ppm, Ca – 300ppm, Cr – 30ppm, Fe – 300ppm, As – 30ppm, Pb – 30ppm, Cd – 6ppm). Prevention: Wash thoroughly after handling. Do no eat, drink or smoke when using this product. Response: IF SWALLOWED: Call a POISON CENTER or doctor if you feel unwell. Rinse mouth.